Day 4 of our Vision to Provision programme is fast approaching. If you haven't already booked onto the course, please do so via Havering Education Services portal. This programme is free to all EYFS leads across Havering. This is one of our most succesful programmes run in collaboration with Havering Education Services. It is run by staff working in schools alongside Havering's Early Years Advisor. 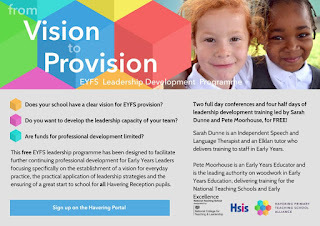 The EYFS Leadership programme has been designed to facilitate further continuing professional development for Early Years Leaders, focusing specifically on the establishment of a vision for everyday practice, the practical application of leadership strategies and the ensuring of a great start to school for all Havering Reception aged pupils. Discussing impact on action plans - what next? 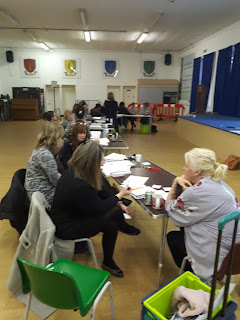 This month we welcomed over 36 Early Years Leaders to Day 3 of our Leadership programme. The Vision 2 Provision programme is run in collaboration with Havering Education Services. Throughout day 3, we evaluated developments of our action plans; how we are leading our teams; reminded ourselves of the stautory requirements of Early Years and explored in depth expected outcomes in writing and how these can be achieved. We had the pleasure of welcoming a team from the East London Early Years and Schools Partnership, to discuss how we implement a self - led learning approach from EYFS through to Year 2 across our Federation. It was great to share our passion, our forever evolving journey and to share ideas to continue developing an approach that we all firmly believe in. An open invite into our environment ensured our visitors got to see our vision in action and how our children thrive through a continuous provision approach. We believe that all children can access learning through self led opportunities which offer variety, curiosity and challenge. Through high quality, purposeful play, children are able to learn practically. Hands-on meaningful experiences will allow them to make sense of the world, encouraging them to explore and investigate in a unique and non-threatening way. Children must be able to play freely and safely while learning to manage risks and make choices about where, how and when they play according to their age, stage and ability. We believe in providing opportunities to ensure that children enjoy high quality self led learning, particularly outdoor free play in stimulating spaces with access to nature, on a daily basis. High quality play opportunities and provision of a physical and social environment that supports play increase the likelihood of improved outcomes for children and lessen the impact of factors that lead to poorer outcomes. Collaborating with other schools benefits us all. It allows us to engage in meaningful conversations, share expertise and gain new ideas. On Monday 21st January, we hosted a training day, focusing on 'Closing the vocabulary gap in year one'. 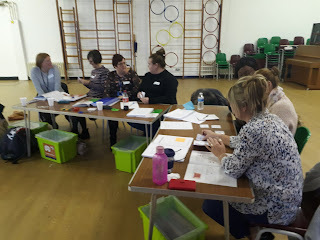 This training was lead by a consultant from Oxford University Press, for the benefit of Year 1 Teachers and Teaching Assistants. developing an understanding of word consciousness through rich oral language experiences. This training was put in place to build on the support children had been receiving as part of the SSIF project being implemented through the Teaching School. Whilst out visiting school this week, it was pleasing to hear that schools have already started implementing strategies that were explored during the training. 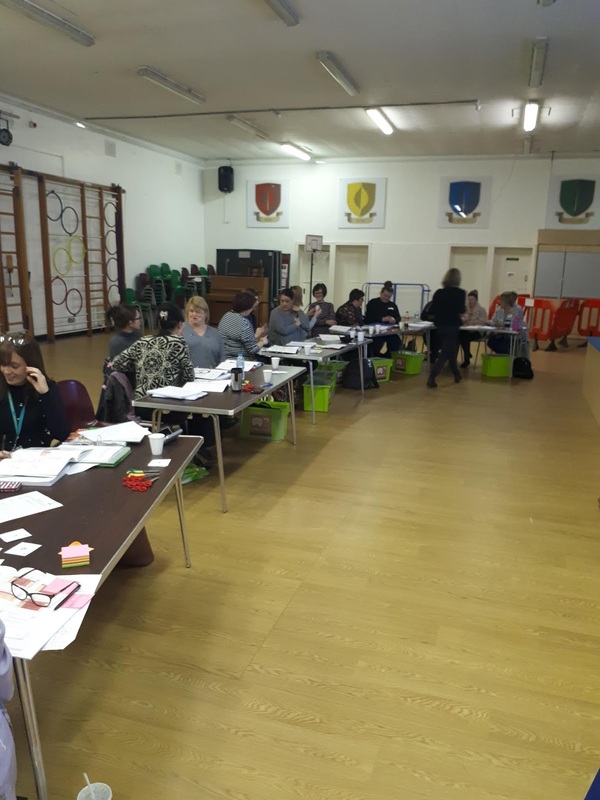 On Friday, we welcomed back our TAs who are implementing The Nuffield Early Language Intervention across 15 school as part of the Strategic School Improvement Fund project. The project is a third of the way through and is now in the final 10 weeks. The project continues to be successful due the commitment, self reflection and knowledge that the TAs are bringing to the project. The Nuffield Early Language Intervention is an evidence-based oral language intervention for children in nursery and reception who show weakness in their oral language skills and who are therefore at risk of experiencing difficulty with reading. It is delivered over 30 weeks by teaching assistants in groups of 3-4 children. The intervention was developed by a team from the University of York, who subsequently carried out a randomised control trial in 15 schools and feeder-nurseries across Yorkshire. After 30 weeks, the children who had received the intervention had improved expressive language skills, including the use of vocabulary and grammar. Their letter-sound knowledge and spelling also improved, indicating the foundations of phonics were in place.